Switzerland Volkswagen Campervan Travel Sticker. 3.5". A brilliant Swiss style, VW camper van sticker. Printed in full colour and machine cut to camper van shape. These great travel stickers are perfect for proudly showing the places around the world that you love, and look equally attractive on V-Dubs, Campers, Laptops, Suitcases, etc. Sticker measures approximately 80mm x 90mm. Stickers are cut to shape, the grey square that you see is backing paper. Racing Numbers Stickers. Chapman Font. Various Sizes. I've Got The Isle Of Man TT Bug 1970's Style TT Races Sticker. 5". Air Cooled Cut Vinyl Sticker. 7". Karmann Shield Style Self Adhesive Car Badge. 1.75". ADAC German Automobile Club Yellow Sticker. 4". 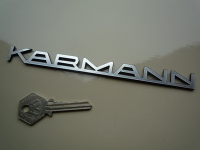 Karmann Logo Laser Cut Self Adhesive Car Badge. 3". 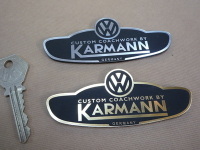 Volkswagen VW Custom Coachwork by Karmann Self Adhesive Car Badge. 3.75". 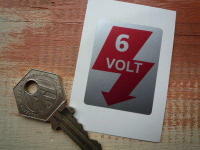 6 Volt Sticker. 20mm, 30mm, or 45mm. ADAC German Automobile Club Black & White Sticker. 3.5". Karmann Text Laser Cut Self Adhesive Car Badge. 5" or 7". No Bratwurst Funny German Van/Car Sticker. 5". VW Volkswagen Wheel Centre Stickers. Set of 4. 50mm. 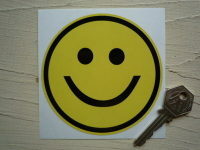 Smiley Face Classic Style Sticker. 4". VW Cut Out Logo Laser Cut Self Adhesive Car Badge. 44mm, 50mm, or 80mm. 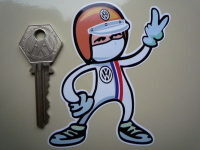 Volkswagen VW Driver 2 Fingered Salute Sticker. 3.5". Tissot Swiss Watch Sponsors Stickers. 4" or 12" Pair.